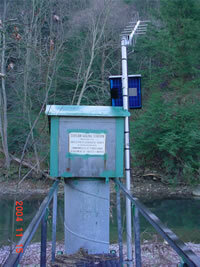 LOCATION.--Lat 40`42'57", long 79`41'59", Butler County, Hydrologic Unit 05010009, on right bank 0.6 mi upstream from Little Buffalo Creek and 3 mi north of Freeport. PERIOD OF RECORD.--October 1940 to current year. Monthly discharge only for October 1940, published in WSP 1305. GAGE.--Water-stage recorder. Elevation of gage is 792 ft above National Geodetic Vertical Datum of 1929. Prior to July 19, 1962, non-recording gage at same site and datum.